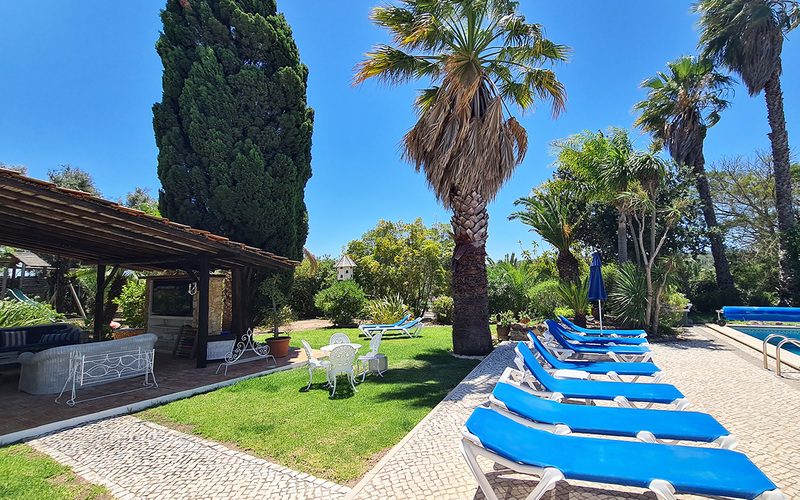 Just 10 minutes from the historic town of Lagos and the famous honey coloured beaches of the southern Algarve, Quinta das Achadas sits in a secluded oasis shaded by palm trees and succulent plants. Take breakfast on your own private terrace surrounded by fig, almond and orange trees. Expect farm fresh eggs and newly baked bread accompanied by homemade preserves. Twice a week, the Quinta’s friendly owners, Jill and Julio Pires, offer a communal 3 course evening meal served in their open plan, country kitchen. Apartments and rooms are furnished to a high standard and have been tastefully decorated in a rustic style. You’ll find comfy chairs, modern luxurious bathrooms, wood-burning stoves, warm throws and original art works. There are books to help you while away the hours whilst relaxing around the large, salt water swimming pool - alternatively take a romantic dip in the outdoor hot tub on a moon-lit night! Children are very welcome, and have a separate play and games area. Jill and Julio are always on hand to assist with your needs and to share their extensive local knowledge. Service is friendly but unobtrusive, the ambience relaxed and understated.